Let us help you get ready to welcome your new child to your home with a detailed list of items you need to know. 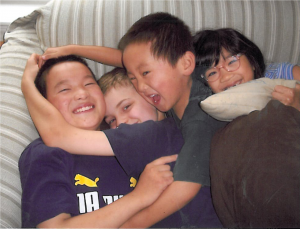 China Adoption With Love, Inc. has been helping parents adopt children from China since 1995. Here is some helpful information on qualifications, medical risks, and documentation. We strongly encourage prospective adoptive parents to visit two websites. One is for the State Department and another one is for the Council on Accreditation, the agency that provides Hague Convention accreditation for adoption agencies in the international adoption field. Attention: Our China adoption agency closed our traditional adoption program owing to the long wait for healthy children assignments. For the time being, we only place children with special needs and only accept applications from families who have already accepted a match. Here is the basic outline of steps necessary to complete the process and program for special needs adoption in Brookline MA. The majority of the steps are required by Chinese, federal, state, and local regulations. Minimum 30 years old, maximum 55 years old (Please call if you are above the limit). No jail term(s) served. Drug crimes are not tolerated. No alcohol abuse or related crimes within the past 10 years. No serious criminal records in the past 10 years. You and your spouse must be legally married for a minimum of two years at the time your documents are sent to China if this is your first marriage. If either of you has been divorced, you need to be married for five years at the time your dossier is sent to China. No more than two divorces between both spouses. No more than five children at home; the youngest child should be at least 3 year old. Minimum annual household income of $10,000 per person, including the intended child. The husband and wife are physically and mentally healthy. No medication for severe mental disorders such as depression, mania, or anxiety in past two years. Each parent must have earned at least a high school diploma. The parents should receive a favorable home study by a licensed non-profit and Hague-accredited adoption agency. Single-women adopters are allowed, but no homosexuals pursuant to Chinese regulations. Body Mass Index (BMI) of 40 or under. Parent(s) must have an email address. A home study is required by each state, the U.S. Citizenship and Immigration Service (USCIS, formerly the INS), and the People's Republic of China for all adopting parents. It ensures that children are placed in safe, stable and loving homes, with families who are prepared for all that adoptive parenting entails. Advanced processing is a procedure for completing the part of an orphan petition relating to the petitioner before an orphan is located so that there will be no unnecessary delays in processing the petition after an orphan is located. The I-800A petition shall be filed with the help of your social worker along with the completed home study to the USCIS. The USCIS approval is valid for 15 months. It is your responsibility to make sure that your USCIS approval does not expire. If you are concerned that it will expire before you return home from China with your child, please contact the agency as soon as possible. You will need to re-do the I-800A Supplement 3 form and complete a home study update. We do not want your referral to be held up because your USCIS approval expires. It is best to keep track of the date and to begin to re-apply before it expires. Chinese children are considered legally available for adoption when the birth parents cannot be found. There is no prenatal care record or family medical history available. Both males and females are available for adoption; this includes ages between infant and 13 years old. Most children available for adoption now are older children with medical needs, some of which are severe. We have no identifying information on the children’s birth parents or their medical history. We have no records of their prenatal care. The lab work in the physical exam is completed when the child is young and may not be reliable. The doctors who conduct the Chinese physical exam and the visa physical exam for the American Consulate are human beings, and they can make mistakes. There is ALWAYS a possibility of a false negative or false positive on blood tests. All children are vaccinated for TB in China. Therefore, upon return, the “arm test” done here to test for TB will show up to be positive; however, the chest X-ray shows no active TB. The decision to treat your child will be up to you and your pediatrician. For more information on the health risks associated with this, please consult your pediatrician. Developmental delays are to be expected—gross/fine motor skills, language reception/expression, etc. Most children are quite resilient and are able to catch up, but some may struggle more than others. We encourage all families to have their child evaluated by Early Intervention when they arrive from China so they can receive services to help them reach their developmental target. Lead poisoning is another risk. Of the about 1,900 children we have placed in the past 17 years, about 10 children have been reported to have high lead levels (ranged from 13 - 62). Please talk to your doctor to find out more about what this means, as well as what it may mean legally if the level is more than 25. We urge Massachusetts families to learn more about the medical and legal ramifications of elevated lead levels. We make this recommendation to seek out information on lead poisoning prevention and international adoption for families from other states, too. Physical, emotional and sexual abuse. Some children may have suffered these abuses and they are at high risk of RED and other potential emotional and physiological disorders. For our Waiting Children program, the agency cannot guarantee that the medical records from China will have a completely accurate diagnosis. There is no time limit for you to consult your doctors before you accept a match. Travel-related medical risks to both the children and adults need to be addressed; these include the chicken pox, measles, SARS, etc. *If you have lived outside of the United States for any period longer than one year in the last five years and you were 18 years old or older, we will also need your police clearance from those countries. The process from home study to travel to China takes about one to two years. There are four time factors—home study, I-800A process with USCIS, matching process, and travel. It will take about five to six months to complete your home study, receive USCIS approval, and complete the documents required for your dossier. It takes another month to get your documents notarized, certified and authenticated. After we express mail your dossier to China, it takes about three months for the CCCWA to get your documents registered, translated, reviewed and approved. When you accept a match, the CCCWA will issue a official document called Letter of Acceptance. You will need to apply for the I-800 pre-approval and Article 5 approval with this document. Then the travel plans will be made after we have received your travel notice from China. From the day we receive your travel notice, it takes about four weeks to travel to China. The trip to China for the adoption takes about 12 to 16 days. At least one parent is required to travel to China. It is very important to note that the time frame is always subject to change. There are many variables that can make this process longer, as well as shorter. We will do our best to update you on varying time changes. Our agency will recommend travel agencies to you. Travel costs vary according to the season, the location of the orphanage and the services you will receive. For international and domestic airfare, hotel reservations (double occupancy), local and national guides, travel to Beijing, Guangzhou, and the city where the social welfare institute is located, along with local transportation and most meals, the cost is about $4500 to $5,500 per person. For a baby's one-way air ticket to Boston in a lap seat, the cost ranges from $135-$400. For a child's one-way air ticket to Boston, the actual seat can cost anywhere from $680-$1,600. * The application fee is submitted with a completed application to our agency. ** The administrative fee covers document preparation, express mail from this agency, domestic and international communications with CCCWA and orphanages, etc. ***The home study and post-adoption fee of $4,720 is due prior to beginning your home study for full-service families. The administrative fee of $3,900 is due when you receive the USCIS approval. The agency fee of $700 is due when you accept the referral from the China Center of Children's Welfare and Adoption Affairs. Bridge of Love, the adoption service agency under the CCCWA will arrange your adoption trips. Contact us today with questions you have about adopting a special needs child. Headquartered in Brookline, Massachusetts, we help families across the country to adopt children from China.